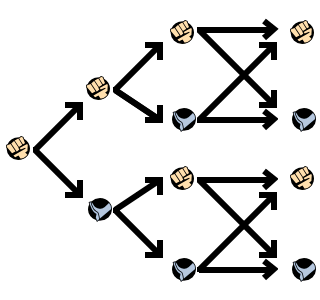 One player may compete against the computer, or two players may simultaneously compete against each other. Each player has an 8-way joystick and 3 buttons. While the Punch and Kick buttons have obvious uses, the Special button is reserved for Guard Cancel attacks and used in conjunction with the other buttons for different attacks. The joystick works intuitively in that pressing left will generally move your character left, and pressing right will generally move your character right. But it is more important to think in terms of relative direction. If your character is facing to the right, then pressing left on the joystick means backward, and pressing right on the joystick means forward. If your character is facing to the left, then pressing left on the joystick means forward, and pressing right on the joystick means backward. For this reason, all instructions are given with respect to forward and backward since the left and right directions change purpose when your character switches directions. Jump diagonally backwards. Jump diagonally forwards, possibly over your opponent's head, switching directions. Block an imminent attack, or move away from your opponent. Move toward your opponent. Blocking crouch. Crouch, avoiding high attacks. All fighters may perform High Jumps, Backsteps, Dashes, and Dash Attacks. To perform a high jump, quickly press , and your fighter will jump higher into the air, but with less horizontal control than normal. To perform a Backstep and quickly retreat from your opponent, tap the joystick . To perform a Dash and quickly approach your opponent, tap the joystick . Hold the joystick forward after Dashing to execute a run. Then press or to perform a Dash Attack. Each battle consists of best-of-three round match between you and your opponent. At the start of each round, both player's life or health bars are full. The first player to drive the other player's health bar to zero wins the round. The first player to win two total rounds wins the match and moves on to the next opponent. If a single player loses to the computer, the game is over and the player must continue to rematch the recent opponent. Standing Punch Used to start a Flash Combo. Standing Kick Pushes an enemy far away. Crouching Punch + The only punch that can be used in a combo. Crouching Kick + The only kick that can be used in a combo. Lean-in Punch + Knocks an airborne foe high into the air. Lean-in Kick + Reverses an opponent (knocks them down). Dashing Punch + Knocks an enemy far away. Dashing Kick + Knocks an enemy back only a little ways. Each fighter has three particular special moves known as "Level-Up Deadly Techniques". Those moves shown at the bottom of the screen in red, yellow, and blue gauges (called Gem Gauges). Those moves are indicated on each fighter's command list with a , , or icon next to the move's name. There are three corresponding colors of Power Gems; red, yellow, and blue. When you collect a Gem of a certain color, the gauge of the corresponding color fills a bit. The larger the gem, the more the gauge fills. Large Gems will max a gauge out and promote it to the next level. There are also Rainbow Gems, shaped like diamonds. They work like Power Gems, but add energy to all three gauges instead of just one. When a Gem Gauge of a certain color fills completely, it upgrades from Level 1 to Level 2 and empties. The move that corresponds with that gauge will become more powerful as well. Fill the gauge again and it will upgrade to Level 3, making that move very powerful. As an example, Ken's Hadouken is his "red" move. When he collects enough Red Gems, the Hadouken reaches Level 2. It burns and will set his opponent on fire when it hits. When he collects even more Red Gems, it becomes a Level 3 Hadouken and increases in size. As a general rule, a higher-level move will do more hits and damage than a low-level move, and it will override low-level moves in some instances (for example, a Level 3 fireball would negate a Level 2 fireball and continue across the screen. Note, however, that a Mighty Combo projectile beats a Level 3 fireball). Akuma is the only fighter that has two moves which share a Gem Gauge; Gou Hadouken and Zankuu Hadouken. Gems have other advantages as well: collecting them also adds to your Mighty Combo meter, and you can use them for the Mega Crush or Mega Counter attacks (see below). The most common way to collect Gems is to hit your opponent. Doing so will cause Gems of random colors to fall to the floor. Note that these Gems are not the Gems used by your opponent to upgrade his or her Level-Up moves. Most attacks release small Gems, while Mighty Combos release medium and large Gems. You may also use Guard Crushes to collect Gems. They always release a large Gem at best, or else a combination of smaller gems equal to the amount of power your enemy has stored up. And finally, another way is to get them from a treasure box, which may have Gems inside of it. Blocking in Pocket Fighter works similar to most other Street Fighter games; Push backward to block high attacks, or down back to block low attacks. An attack can be retaliated against by blocking the attack, then pushing + while in block stun. This is called a Guard Cancel and consumes one super meter. An fighting may execute an attack that passes through their opponent's block, known as a Guard Crush. There are three ways to execute Guard Crushes, and they always liberate a particular color of gem from your opponent that reduces their Gem Gauge. These are executed by pushing (which will always result in gems), + (which results in gems), or + (which produces gems). The Special button can be held down to charge the Guard Crush at this time. The longer the button is held, the more powerful the resulting attack will be. The color of the energy will go through a cycle of blue, to yellow, to red as it gets stronger. If you hold the button down after the energy is red for a while, the attack will execute automatically. Finally, there is a Guard Return. If you are about to be struck by a Guard Crush, you can press + . You character will flash blue for a small moment. If your character is hit by a Guard Crush while flashing blue, you will not be hit by the Guard Crush, and execute a damaging counter attack. Each player has a super meter immediately below the health bar shown at the top of the screen. As the player attacks the opponent, performs special moves, or attacks the opponent, the super meter fills up incrementally. You will gain more super meter from special attacks that are leveled up. The super meter fills up to nine levels of power. If you have at least a Level 2 ranking for one of your Level Up Deadly Techniques and one or more levels of Super Meter energy, you can use the Mega Crush (at the costs of all your Super Meter and Gem Gauge energy). Using the same requirements listed for the Mega Crush, you can also use a Counter Crush if you are reversed in mid-air. Using a Counter Crush also drains you of all your Super Meter and Gem Gauge energy. If you have at least one level of Super Meter energy or higher, you can use the Guard Cancel. All Flash Combos are initiated with the Punch button. If you execute a Flash Combo all the way to the fourth hit, you will end with a special finishing attack. Only the second and fourth hits determine which endings are available in a Flash Combo sequence. The choice for the third hit is entirely optional. For every Flash Combo, the top and bottom attacks will either end by launching your opponent in the air, or knocking them back far away. The two middle attacks will either Guard Crush your opponent, or execute a Strong Throw. All fighter's Flash Combo costume changes are illustrated on their respective character pages. In Pocket Fighter, Throws are executed by pressing or and + together. Some fighters may execute an Air Throw by press + while close to the opponent in mid-air. You can escape from being thrown by pressing + at the moment that your opponent begins to throw you. Every character can execute two additional types of throws by executing + + and + + . These will result in either a Strong Throw or a Special Throw. Special Throws inflict more damage than normal throws. Strong Throws cannot be escaped out of, and you can hold + to increase the damage done. Whether a throw results in a Strong or Special Throw depends on your character. After your opponent has been knocked down to the ground, you can execute a follow-up attack by pressing + or immediately, for an extra hit. If you have been knocked down, you may press or along with any button to begin rolling backward or forward before rising back up to your feet. You may also tap the button to perform an Easy Reversal, which instantly executes a counter attack move from the knock down position. To perform a Mega Crush, you must have at least one level of Super Meter, and you must press + + together. If you do, you will lose all of your stored Super Meter, and all of your Gem Gauges will empty. As they empty, the gems that supplied those gauges will fly out of your body and attack your opponent. Once they land on the floor, they may be collected again by either player. You may execute a Mega Crush in mid-air. Also, if you have been attacked in mid-air, you may execute a Counter Crash in the same manner, which is a more powerful form of the attack. Lastly, your character can taunt the opponent. In the arcade, this is performed by pressing your start button. On consoles, this is typically performed by pressing the select button, or a particular shoulder button. Taunts are generally just for fun, and initiate a short animation for your character. You are entirely vulnerable when this occurs, so it is best to taunt when you feel entirely safe from attack for the next second or two. Some taunts can actually connect and put the opponent in his or her stun animation, while not actually doing any damage to the opponent. This page was last edited on 25 October 2010, at 02:49. This page has been accessed 22,086 times.